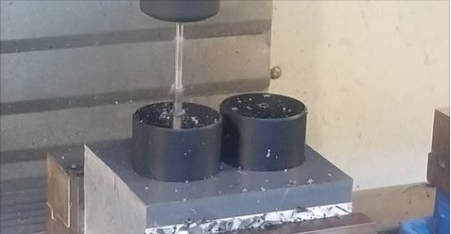 Machining the finishing touches on these Delrin 527UV oilfield components today. DuPont’s Delrin 527UV is a black acetal homopolymer enhanced with UV stabilizers which allow for improved performance in extended UV exposure. Also, this Delrin grade exhibits enhanced thermal characteristics and increased dimensional stability making it a great option for outdoor, tight tolerance mechanical applications. PlasTex Precision in Houston, TX specializes in CNC machining of plastics including PEEK, Delrin, PTFE, Nylon, UHMW, HDPE, and many more. How can we help today?